Welcome to New England where the weather is never sure of itself. Recently, I popped into Marshall's and picked up a few fall accessories. One of them being this gorgeous cape. For such a bargain, I got that designer look! The color scheme is my favorite part. Maroon, forest green and purple are all in there and it is such a statement. Turtleneck; Calypso. 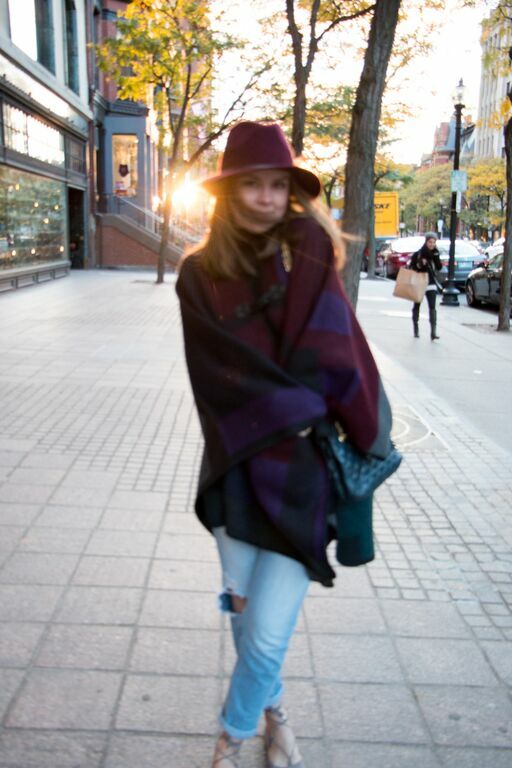 Cape, Hat, Shoes; Steve Madden. Jeans; H&M. Bag; Bloomingdale's. To accessorize carefully, I wore my cranberry hat, light wash jeans, a black turtleneck, some lace up flats and a vintage forest green bag. This is the ultimate ensemble for pretty much any occasion. Pair it with riding boots and skinny jeans and you have a completely different look! I love the versatility of each piece. Stay tuned until next week for more fall fashion on WGSAY!